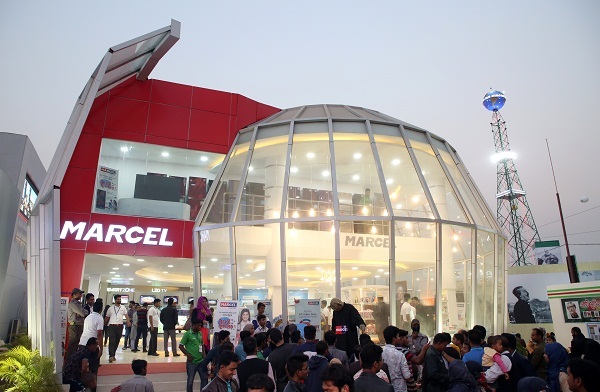 A large number of buyers and visitors are thronging Marcel Pavilion to pick up their desired electronics and electrical appliances at affordable and discounted prices before the end of the ongoing month-long Dhaka International Trade Fair-2019. During several visits to the premises of the fair during the last couple of days, it was found that a large number of buyers were swarming to the Marcel Pavilion on to pick up their desired appliances. The sales executives of the local pavilion were also passing very busy hours in dealing with the huge customers’ flow. At Marcel Pavilion, they are offering 12 percent cash discounts on its all models of refrigerators and freezers. Customers of Marcel LED and Smart televisions are enjoying 12 percent and 15 percent cash discounts respectively. A flat15 percent discounts are offered to the air conditioners’ customers. The buyers of home appliances at Marcel Pavilion are getting 10 to 12 percent discounts. Apart from these, customers of Marcel fridges, televisions and air conditioners can also get various sorts of attractive awards like sure cash vouchers up to Tk 1 lakh, free motorcycle, laptop, refrigerator, television, air conditioner and other sorts of home and electrical appliances through registering products purchased from Marcel Pavilion in the DITF-19 under the company’s ongoing nationwide Digital Campaign Season 4. Dr. Md. Shakhawat Hossen, Head of Sales of Marcel, said, the number of buyers and visitors at Marcel Pavilion in each and every days of this year’s DITF were satisfactory. 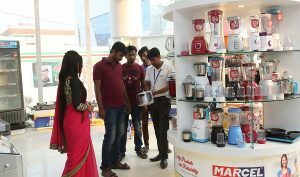 Most of the visitors and buyers of the fair entered into the Marcel Pavilion for at least once to see the ‘Made in Bangladesh’ labeled electronics and electrical appliances, he said. In the last moment of this expo, a good number of buyers are thronging Marcel Pavilion to purchase highest standard fridges, televisions, laptops, smartphones and other sorts of appliances, he said and hoped that the participation of Marcel in this year DITF would be successful. Marcel Pavilion In-charge Saiful Islam said, said, they are displaying and selling around three hundred models of over 30 sorts of electronics, electrical, home and kitchen appliances, which are suitable for all classes of people. In addition, customers are offered 8 percent discount on electronics and electrical home and kitchen appliances, along with free home delivery facility, at the fair. Thus, a good number of buyers are swarming Marcel pavilion to buy products at discounted rates, he added. At the first floor of the Marcel Pavilion, total of 72 huge energy saving fridges are showcased, of which 58 models of frost, 2 models of non-frost and 12 models of freezers. Marcel is displaying total of 20 models of huge energy saving world’s latest technologies’ air conditioners in the DITF like IoT based Smart AC, inverter and ionizer technologies ACs. In addition, Marcel Pavilion was decorated with 72 models of LED and Smart TVs; 6 models of microwave ovens, pressure cookers and irons; 27 models of LPG and NG-run single and double burners’ gas stoves; 24 models of LED lights; 14 models of blenders; 9 models of rechargeable table fans; 7 models of rechargeable batteries; 5 models of electric kettles, kitchen cookware and ceiling fans; 4 models of room heater; 2 models of voltage stabilizers and auto voltage protectors, washing machine, induction cooker and wall fan.